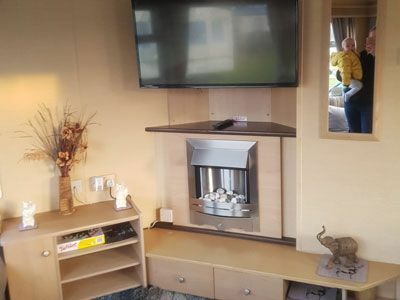 Situated on the popular Beech Grove area of Flamingo Land close to all amenities we offer our Luxury Willerby Westmorland 35 ft x 12 ft holiday home. Large grassed area beside so it's easy to keep an eye on the children. Double glazed for extra comfort at very competitive prices. Sleeps 6 in 3 Bedrooms (one double and 2 twin) all with Electric Blow heating, cupboard and drawer space. The spacious lounge is equipped with Electric Fire , 40" hdmi TV, & Freeview with an assortment of DVDs to watch, & Xbox 360 with an assortment of games to play. The fully fitted kitchen is complete with full size gas oven and hob, fridge freezer, microwave, toaster, all cutlery crockery pots and pans are provided including a hoover, iron. The caravan has a walk in shower and WC. There is also a separate toilet. Fresh bed linen is provided and a heated blanket on the double bed, all you need to supply is your own towels. Wristbands must be purchased from Flamingo Land which gives you unlimited access to all amenities on site. These are separate to the hire of the caravan. £50 Deposit / Bond secures booking (non refundable) if holiday cancelled. This will be refunded on inspection of caravan within 7 days of your stay.